In one of the most profound developments in the central bank gold market for a long time, the Hungarian National Bank, Hungary's central bank, has just announced a 10 fold jump in its monetary gold holdings. 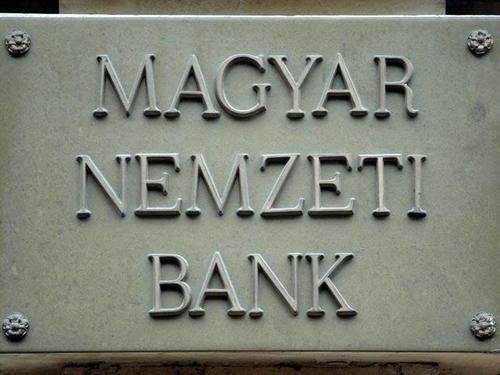 The central bank, known as Magyar Nemzeti Bank (MNB) in Hungarian, made the announcement in Budapest, Hungary's capital. Before this month, Hungary's central bank held 3.10 tonnes of gold. During the first two weeks of October, the Hungarian National Bank purchased 28.4 tonnes of gold. This gold purchase raised the central bank's gold holdings from 3.1 tonnes to 31.5 tonnes, i.e. a 1000% or 10-fold increase. 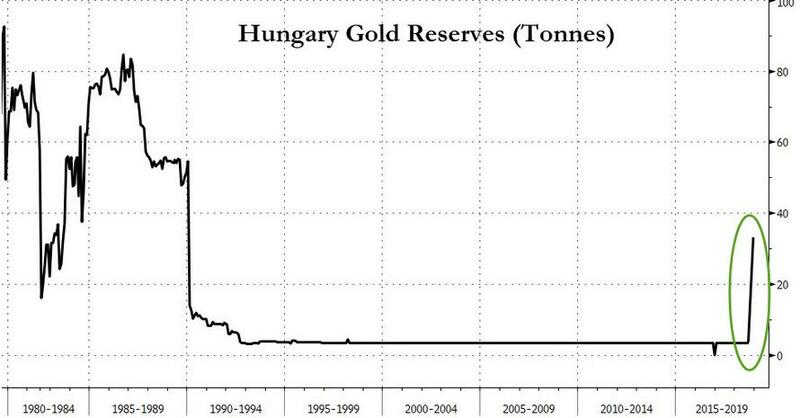 The Hungarian central bank had not altered its gold reserves since 1986, i.e. 32 years ago. The 28.4 tonnes of gold was purchased in 'physical form', and 'its repatriation has already taken place' to Hungary. Interestingly, Hungary now holds the same amount of gold as it held 70 years ago. 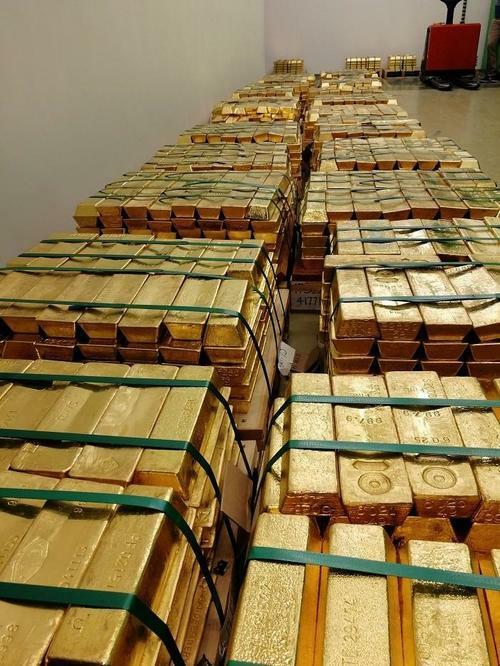 Some of the newly purchased gold bars of the Hungarian central bank. This gold has also been repatriated to Hungary. "Budapest, October 16, 2018 - In view of the long-term national and economic strategy goals, the Monetary Council of the National Bank of Hungary has decided to increase the gold reserves of the country. As a result, in October 2018 the Bank's precious metal holdings were raised from the previous 3.10 tonnes to 31.5 tonnes, a tenfold increase. This is the first time that the Hungarian National Bank has bought gold since 1986. Following the substantial increase in the Bank's gold reserves in physical form, its repatriation has already taken place. The possession of precious metal within the country is in line with international trends, supports financial stability and strengthens market confidence in Hungary. In keeping with the historical role of gold, gold remains one of the safest instruments in the world, and, even under normal market conditions, provides a stability and confidence-building function. With current holdings of 31.5 tonnes gold reserves, valued at approximately $ 1.24 billion, this size of holdings approaches the historical level that was held by our country at the time of the "golden train". Within the overall international reserves of the Bank, the share of gold reserves has now risen to 4.4%, which corresponds to the average of non-euro area Central and Eastern European countries. The role of gold reserves in the nation and in the nation's economy strategy is becoming more and more appreciated while both the possession and the increase of nations' precious metals holdings appears to be decisive international trends. This gold purchase process, based on the strategic decision of the Hungarian National Bank, has increased the domestic gold reserves to 31.5 tonnes. The raising of the gold reserve and the returning of the gold in physical form to Hungary took place in the first half of October 2018. Increasing and repatriating gold reserves can be considered a significant step in economic history. Since the founding of the Hungarian National Bank in 1924, gold reserves have been maintained, but the stock of that gold has fluctuated considerably over the decades, depending on the purpose of why it was held. At the end of World War II, Hungary received some 30 tonnes of gold bars and gold coins on the MNB's legendary "gold train" in the Spital am Pyhrn in Austria. This amount was fully returned to the country after the war while providing cover for the introduction of the new currency of the country, the Forint, thus supporting financial consolidation and the stabilization of the post-war Hungarian economy. At the end of the eighties, Hungary's gold reserves, driven by short-term investment objectives, fluctuated between 40 and 50 tons and then, at the time of the change of regime (between 1989 and 1992), the ruling central bank executives decided to reduce to a minimum level of about 3.1 tons, which was the level at the end of September 2018. With the decision of the MNB today in October 2018, the holdings of 31.5 tonnes of gold reserves is now the same as the level of the stabilization period of 1946. Gold reserves are held for short-term investment and / or long-term stability purposes by national central banks. The current decision of the Hungarian National Bank was led by the goal of stability, and there are no investment concerns behind the holding of gold reserves. Gold is not only for extreme market environments, structural changes in the international financial system, and deeper geopolitical crises. Gold also has a confidence-building effect in normal times, that is, gold can play a role in stabilizing and defending. Gold is still considered to be one of the world's safest assets, whose characteristics can be attributed to gold's unique properties such as finite supply of physical gold, and lack of credit and counterparty risk given that gold is not a claim against a specific partner or country. Over the past few years, more and more countries have decided to continue to play a decisive role in the use of gold as a traditional reserve asset, and have raised their gold reserves. This course of action was followed by Poland [a neighbor of Hungary], in spite of the fact that Poland had already one of the highest gold reserves in the region. When raising domestic gold reserves to 31.5 tonnes, the MNB also paid attention to the international and regional role played by gold in central bank reserves. As a result, the Hungarian gold reserve have now increased to 4.4% which is in line with average international reserve ratio for gold for the Central Eastern European region central banks. This move from the end of the international rankings to the middle of the rankings has progressed, both in terms of size and proportion of gold reserves. Note that Hungary is a member of the European Union (EU), and therefore the Hungarian National Bank is a member of the European System of Central Banks (ESCB). However, as Hungary is not a member of the Eurozone and does not use the Euro, the Hungarian National Bank is not a member central bank of the European Central Bank (ECB). With Hungary recently under attack from the European Parliament in September, the timing of this new gold purchase by Hungary's central bank in early October is very interesting, to say the least. In addition to this new Hungarian gold purchase, Reuters is reporting that updated data from the IMF shows that Poland continued to increase its gold purchases in September 2018, raising its gold reserve holdings by 4.4 tonnes during the month to 117 tonnes. This follows similar gold purchases that the Polish central bank made in the summer, when the bank bought two tonnes of gold in July and seven tonnes of gold in August. With almost all of Poland's gold held at the Bank of England, a relevant question now is how long before Poland also sees fit to repatriate its gold in physical form away from the fractionally-backed LBMA controlled gold trading centre of London. Another of Hungary's close neighbors, Austria, has itself spent the last 3 years repatriating 140 tonnes of its gold from the Bank of England in London and has nearly completed this repatriation operation now. Add to this the high-profile Germany Bundesbank gold repatriation program in recent years, and a similar gold repatriation exercise from the Netherlands central bank, and the trend is clear: central banks in Europe have been flocking to shore up their international reserves with gold, because, as in the words of the Hungarian central bank "Gold is still considered to be one of the world's safest assets".